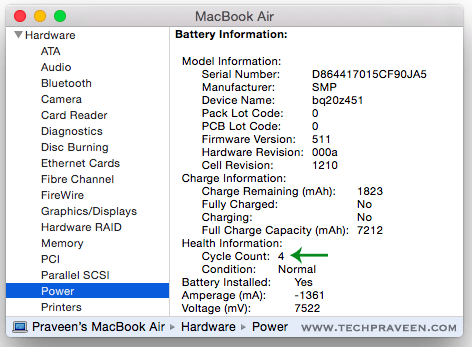 How to Check Mac Notebooks Battery Cycle Count? 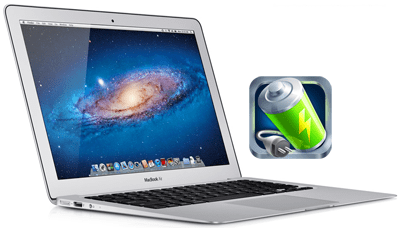 You are here: Home / Mac / How to Check Mac Notebooks Battery Cycle Count? Before you check the MacBook Battery cycle count, it’s important to know a few facts. All our gadgets like smartphones, tablets and laptops use lithium-ion batteries. These batteries will lose capacity over time. Batteries are designed to retain up to 80% of their capacity for a limited number of charge cycles. This number will be slightly higher for bigger, more expensive batteries, typically found in tablets or laptops. For instance, Apple claims that the iPhone can hold 80 percent of its capacity for 500 charge cycles, while the number is 1,000 for iPad and MacBook models. The exact number will vary across devices but this is a fair benchmark. The battery completes one charge cycle when you charge it to 100 percent and drain it to 0. If you charge it to 50 percent and then drain it completely, you only complete half a charge cycle. The reality is a little more complicated than that, but it’s a good general rule of thumb. That means that you can’t avoid charge cycles by bringing your phone back to 100 percent whenever it hits 90 – ten such charges will count as a charge cycle.Use the steps in this article to determine the cycles on your Mac notebook’s battery (OS X v10.4 or later). Batteries have a limited amount of charge cycles before they are considered to be consumed. Once consumed, a replacement battery is recommended. You can use your battery after it reaches its maximum cycle count, but you may notice a reduction in your battery life. Knowing how many charge cycles are on your battery and how many are left can help you determine when a battery replacement is required. For optimal performance, replace your battery when you reach the maximum cycle count. OS X Snow Leopard v10.6.8 or earlier: Open Apple System Profiler by choosing “About this Mac” from the Apple () menu. Then, click “More Info”. OS X Lion v10.7 or later: Open System Information by choosing “About this Mac” from the Apple () menu. Click Power in the Contents list from left hand side category. The current cycle count is listed under the Battery Information section. Credits: Apple Official Page – Know more about cycle count limits for your MacBook model number.